At this point I would like to let others to talk about my works. You will find here comments from seminar participants as well as press articles. I promised myself by the training staff a year ago that the work with animals will be a little better. It was not a bit better, but rather much better. We can clearly see it by pups. Before, when I get off my car, the animals were running away. Today I get off and drive the animals where I want them to go. The work is now not only faster, we also need fewer people. Hi Philip, the loading of the spreader, as you've recommended it, did work out great. Our two (somewhat skeptical) people were deeply impressed. Hello Mr. Wenz, My husband and I were in their introduction lesson about organic in Thalfang. In the meantime, Michael had the opportunity to apply what he learned. He sold 8 cattle and traded 2 cattle drives with new method, alone, and under the eyes of a critical father (mark of skeptical attender). It was great, went without problems or stress for all involved people. My father-in-law said: "He would have not believed it if he had not seen it with his own eyes." Thank you that we were allowed to watch and learn from you. Hello Mr. Wenz, I'm glad having accepted the wide way on Tuesday. It was a long time ago that I visited a seminar which was worth. I am today still impressed how the animals did what we wanted, being calm and stress free. I realized then what I did wrong and a lot of problems in the handling of the animals are now clear to me. We often wondered why they do not what I want. And we solved this problem with more pressure. The result was clear, both animals and humans were stressed. Now I know why and I can change it. I've tried it the next day and I am always fascinated how much can be achieved with little effort. Of course, I still have a lot to learn and to practice. Lastly, there is now no master who fell from the sky but it's a start. Something has already changed; I pay much more attention to my cows and try to avoid unnecessary stress. I can only recommend every cattle’s owner to attend your seminar . I am practicing assiduously with my cows. I have however not found the ideal way to bring them back to the stall. I noticed that in the milking parlor should I need to get closer to the cows than in the barn to make them move. But I am still amazed how it works. It is especially great with the very nervous animals and the milking cluster does not fly constantly in the air. I have a cow; when she comes in the milking parlor with stress and pressure, you can hardly run at her. Thanks to low stress stockmanship it works much better now. Dear Mr. Wenz, I just wanted to express my praise, because I had attended your course in Switzerland on the Thuner Lake. It was very impressed, that you manage to communicate people the principle of "Cow Sense". So far I only knew the cattle drives from the horse's back, but am amazed at how simple and quiet it can go by foot without any obstruction. I was skeptical that after over 30 years working with dairy cattle someone could really tell me something new, and did not promise me a lot of employee training. But the 3.5 hour seminar has opened a new understanding. The lecture was interesting, inspiring and entertaining. You could see that it was not just me, but also the colleagues who have milked in the morning shift, who listened attentively to the end. The agricultural professional association Franken und Oberbayern (Franconia and Upper Bavaria) organized, during the summer of 2010, a series of lectures for multipliers (consultants, technical teacher, faculty and hoof orderly). You can find here the press release (pdf format, 113 kb). The feedback of the method was really good. It should be considerate even in Bavaria to include LSS in the apprenticeship. Thanks to a big persistence of a Angus breeder in the forest region, Hesse, a day seminar came out, which reported on the Agricultural weekly paper under the title “Die sanfte Cowboy” (=The Gentle Cowboy) (pdf format, 323 kb). Hesse LSS (pdf format 61 kb), the counseling also reported on the event. Now, it went far, even the German newspaper “Bild” (!) became interested in my work and this lead to an article (801 kb). During the spring 2008 I was invited to hold a seminar in Switzerland. Subsequent to this seminar, a detailed article (pdf format, 612 kb) and a poster (pdf format, 388 kb) were published in the specialist journal “Die Grüne” (“The Green”). 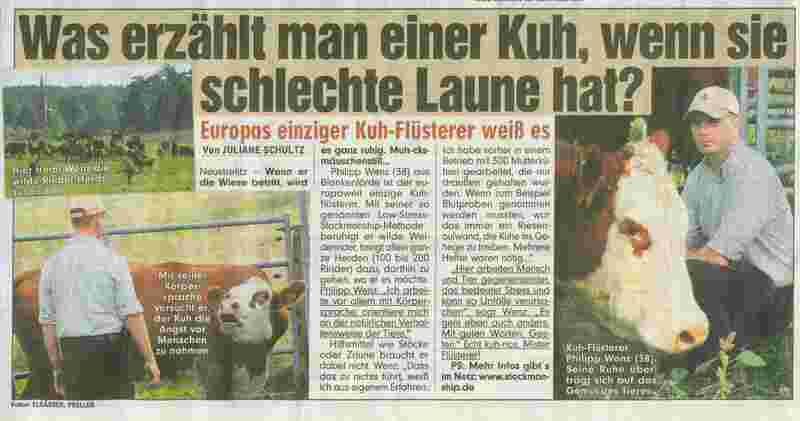 One of my articles “Sicher mit Rindern umgehen” (“Deal safely with cattle”) (pdf, 305 kb) appeared in the Swiss country newspaper (on April, the 18th 2008). Also during the 2008 spring, I had the opportunity to work for a pastoral forest project (40 aurochs from a 170-acre forest), so they could be bled and vaccinated. From this work, two articles (pdf 56 kb) were published in the local press. To work with these animals, which are kept for over 8 years, during the whole year, in the pastoral forest, were the most challenging animals with which I've worked. One of my articles was published, as a summary of a lecture at the Master Beef - general assembly in Verden, in the first issue 2008 of the bovine meat journal. Unfortunately for space reasons, a table from the original article “Stressarm und sicher mit Rindern umgehen” (“low-stress and safely deal with cattle”) (pdf format, 579 kb) have been removed, that is why there is here the complete manuscript of the article (pdf format, 813 kb).